Fear not though, Wachusett Mountain is open for the season and my season pass is itching to be used. It should be PERFECT skiing weather. We haven't got around to planning our 10th anniversary party yet, and we thought a mid-January party would be a good winter break. Of course all our former, current, and future riders are invited. That's about as far as we've gotten. Our first thought for a date is Friday, January 17th since our ski passes don't work that day. Thoughts? I am taking the kids to school and should be at Wachusett around 9:00AM. Look for the guy in a yellow coat, short skis and no poles. Elevation Gain - 1000 feet (if the summit trails are open). Rough Surface - not at Wachusett! Equipment - I plan to bring my short skis. Well, it looks like this might be the last official ride of the season :-( Monday looks verrrrrry cold and extremely skiable. The weather for tomorrow is looking worse every time I check, but lets hope for the best. Other than the threat of rain, it should be cloudy and low 40s with virtually no wind. I'm not planning to ride in the cold rain again though! Everybody is welcome to join us tomorrow to celebrate the completion of our 20th season. There are 2 starting points, one includes gravel and other one doesn't. Since we are simply riding the Minuteman Bikeway, you can turn around when you get half tired or need to be back early. Otherwise we are going to Davis Square to have a yummy lunch at Dave's Fresh Pasta. They have an assortment of fantastic sandwiches and paninis amount other things. 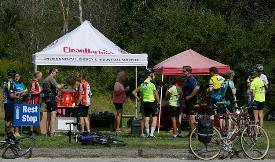 9:30 AM - The Everybody + Ride will leave Fawn Pond. 10:00 AM - The Everybody Ride will leave Bedford Depot Park. 11:30 PM - LUNCH at Dave's Fresh Pasta in Davis Square. AR Index - roughly equal to 25 / 30 flat, smooth miles. Well, Wachusett Mountain Ski Area is closed, but it's still supposed to be frigid (wind chill in the 20s) tomorrow morning. Fearless Leader considered a "Tour de Dunkin" ride with warm up stops, but decided on a hike instead. We will meet at the State Park Headquarters (NOT the ski area) and hike the auto road to the summit. There are really nice views from the top and we can check on snow making efforts. The Fearless Leaders Choice Hike will leave at 9:30 AM. We will return by NOON. Starting Point Map - Wachusett State Park Headquarter. Route Map - Wachusett Mountain. Elevation Gain - 550 feet (1 cat 4 hill). Equipment - I plan to bring warm hiking boots. AR Index - Roughly equal to 6 flat, smooth miles. LUNCH - NOON - The Angler. Combined beginner / recreation ride. Elm Street Playground, West Acton. CHANGE OF PLANS - Combined ride at NOON - Morning Ride Cancelled. Although the forecast is for rain in the morning, it's supposed be SUNNY in the afternoon. It will be windy, but with temperatures around 60 degrees it won't matter. This might be the last time we get to wear shorts this season! So, let's meet at NOON and do a leisurely combined Beginner / Recreation ride to the Assebet River National Wildlife Refuge. The Beginner / Recreation Ride will leave at NOON. We should return by 2:30 PM. Starting Point Map - Acton - Elm Street Playground. Route Map - Acton - ARNWR. Distance - 18 1/2 miles. Rough Surface - 5 miles of beautiful / car free off road. 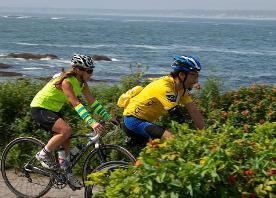 BTW, there may not be a Seacoast Century ride next year, after 40 years Dave Topsham is getting tired. The deadline for early bird rates is this Tuesday! Be part of a ride that's now 1,000 strong! Hello, riders! 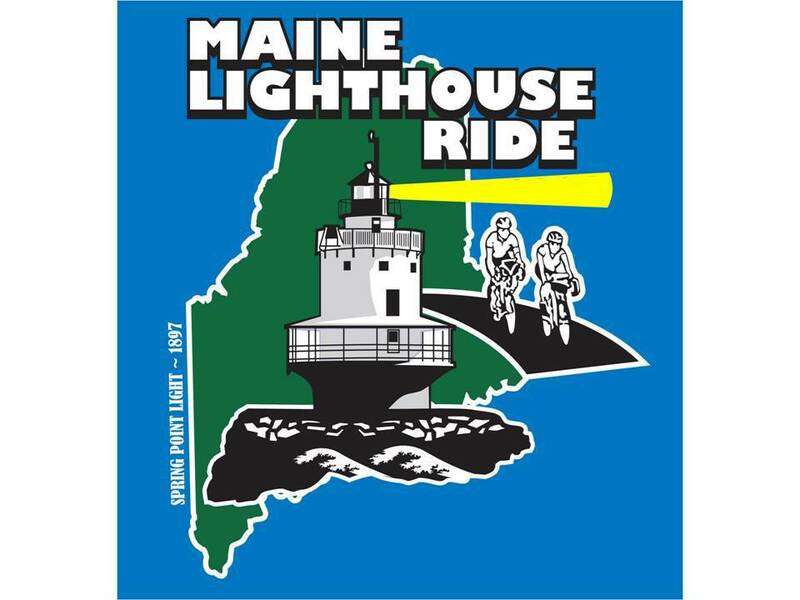 Our largest annual fundraiser, the Maine Lighthouse Ride, will see a boost in its registration fee after midnight this Tuesday, November 19. The fee will increase to $55 for Eastern Trail Alliance members and $70 for non-ETA members. However, children 11 and younger will ride for free, and those from 12-17 will now pay only $25. Don't forget that the first 500 riders receive a free t-shirt. And that an MLR registration makes a great gift for the holidays! If you were a part of the 2013 ride, you'll remember that taste of a typical early fall day in Maine - a cool morning followed by a very warm afternoon. This provided great morning ride conditions, particularly for the 62-mile and Century riders. And the dry weather provided particularly good coastline views! You can see a collection of photos of the riders, volunteers and scenery from the 2013 event, taken by ETA trustee Jim Bucar, by clicking here. 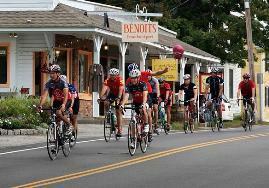 Take advantage of these early-bird rates for next year's ride, scheduled for Saturday, September 6, 2014. Bear in mind that we are likely to sell out again next year! Click here before Tuesday midnight to take advantage of 2013 rates - Register now online! It's no wonder this event is drawing more riders every year, riders of all ages. Many bikers ride in family or social groups and enjoy being part of the larger communal experience, joining both fellow Mainers and numerous out-of-state visitors. 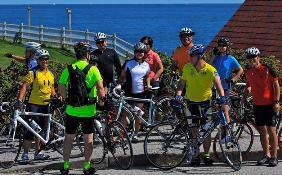 Read much more about this great ride on our web site — including pictures and videos from past Maine Lighthouse Rides. See you on September 6, 2014!!! Click here to Register for the 2014 MLR! Well, the current forecast has the rain basically ending at 8:00 AM with a few showers and strong winds after that. It will be warm though, so I'll try to get the rides in. Elevation Gain - 250 feet. AR Index - Roughly equal to 17 flat, smooth miles. LUNCH - 11:30 to 12:30 - The Local Table. Route Map - Acton - Littleton Beginner. Another frigid day is on tap, and Wachusett Mountain opened on Saturday, so Fearless Leader may not be able to resist temptation. They took our portapotty away! There's lots of snow at Wachusett Mountain, but the weather tomorrow looks good for bicycling. It should be Partly Cloudy and low 40s when we leave with light breezes. Fearless Leader has decided not to become Frozen Leader. He proposes doing a hike instead of a ride. The windchill is supposed to be in the teens! 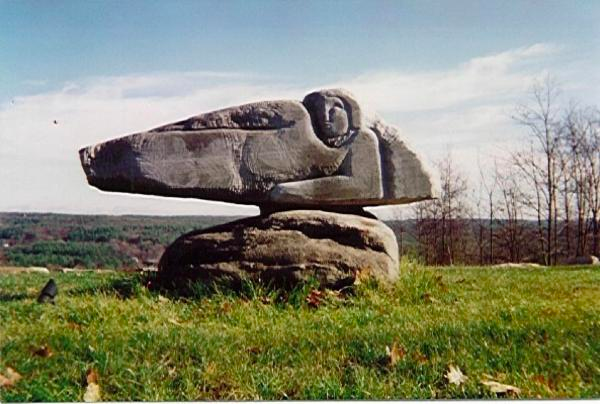 So, one of my favorite places is Andres Institute of Art in Brookline, NH. It's an outdoor sculpture park located at the former Big Bear Mountain Ski Area. Admission is free and as you climb the "mountain" there are some really cool sculptures made by people from all over the world. Here is a couple of my favorites. Starting Point Map - Andres Institute of Art. Route Map - Andres Trail Map. AR Index - Roughly equal to 4 flat, smooth miles. LUNCH - 11:30 AM to 12:30 PM - Chrysanthis. Even though Monday is a holiday (Veteran's Day), we will be doing a combined Beginner / Recreation Ride in the morning followed by a yummy lunch at Filho's. NO AFTERNOON RIDE. The weather is also looking like it's going to cooperate. It should be SUNNY and near 40 degrees when we leave, but it could be a bit windy. It only warms up to the mid 40s but still SUNNY when we return. The ride is designed for maximum interesting places while minimizing hills and distance. The ride starts with mountain views as we pass Groton School on our way Surrenden Farm with more views to the south and west. Then it's DOWN to the Nashua River and UP to the Holdenwood Storybook House. From there we will finish climbing the hill up to quaint and historic Shirley Center (bring a snack). Then it is generally downhill to West Groton and the new Fitch Bridge before riding a piece of the Nashua River Rail Trail back to Groton Center. I allocated 2 1/2 hours for the ride, so we can take our time and enjoy the scenery. The Beginner / Recreation Ride will leave at 9:30 AM. We should return by NOONish. Elevation Gain - 350 feet (to keep you warm). LUNCH - Noon to 1:00 - Filho's Cucina. It's looking MIGHTY cold with highs only reaching the mid 30s. 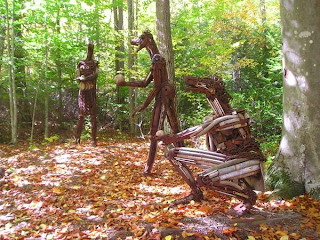 The Fearless Leader may decide a hike around deCordova Sculpture Park or Andres Institute of Art would be more enjoyable. Starting Point Map - TBD. I hope you didn't get used to the beautiful warm weather we had on Wednesday. The beautiful part is staying around for tomorrow, but the warm part is not. Its should be SUNNY and near 40 when we leave and mid 40s when we return, but it will be breezy. We will be going to Dunstable and Tyngsboro and admiring some views, checking out the "Field of Dreams" and looking at not so cute cows. Route Map - Pepperell - Dunstable - Tyngsboro. Rough Surface - a bit. Get ready for the "heat wave" tomorrow! It should be low 40s when we leave with Partly Cloudy skies and light breezes. The temps will climb into the low 50s by the time we return. It was 10 degrees colder on Monday, but the Sun felt wonderfully warm and we had a very nice ride. 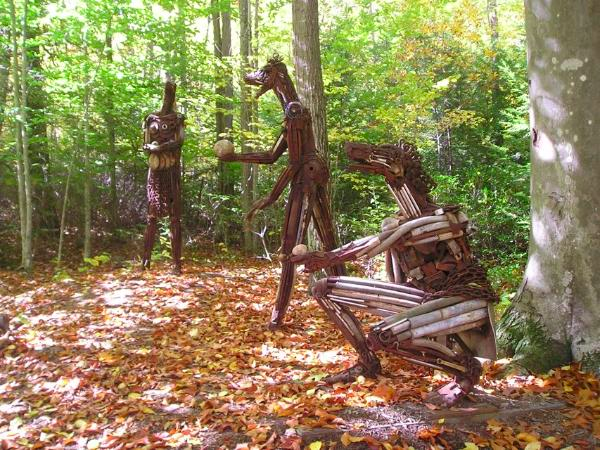 We will visit Monson Center (ghost town in NH) on our way to cute animals at Grand View Farm. From there we get a nice long cruise along the wide shoulder of Route 13 to a delicious LUNCH at Chrysanthi's. Don't fill up too much though, because it still 9 (relatively flat) miles back to East Pepperell. It should be above freezing by 9:30 and SUNNY.